September 08, 1996, L. G. Crabo. 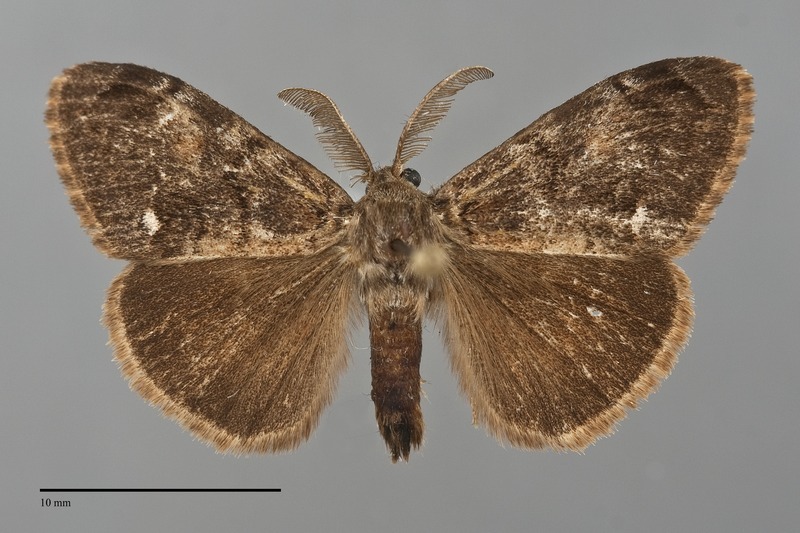 Orgyia vetusta is a brown small rounded-winged moth (FW length 14–15 mm; females lack wings) with a gray-brown forewing with a diffuse pale discal spot, warm brown hindwings, and short broad antennae that flies in southwestern Oregon during the summer and fall. The forewing is short and rounded with a blunt apex and convex outer margin. It is usually dark gray-brown except for a large diffuse tan discal spot. Some specimens have hoary gray frosting, but the few specimens examined from Oregon lack this feature. The dark brown antemedial, postmedial, and subterminal lines are obscure except in hoary specimens. A light subanal spot, white to light tan, is located in the posterior subterminal area slightly above the posterior margin. 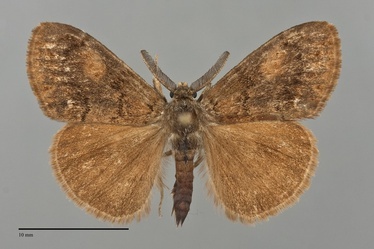 The hindwing is rounded, warm brown with a slight orange case, slightly darker toward the margin. The head and body are dark gray-brown. The male antenna is short and broadly bipectinate. The female has vestigial pad-like wings and is heavy-bodied and nondescript. 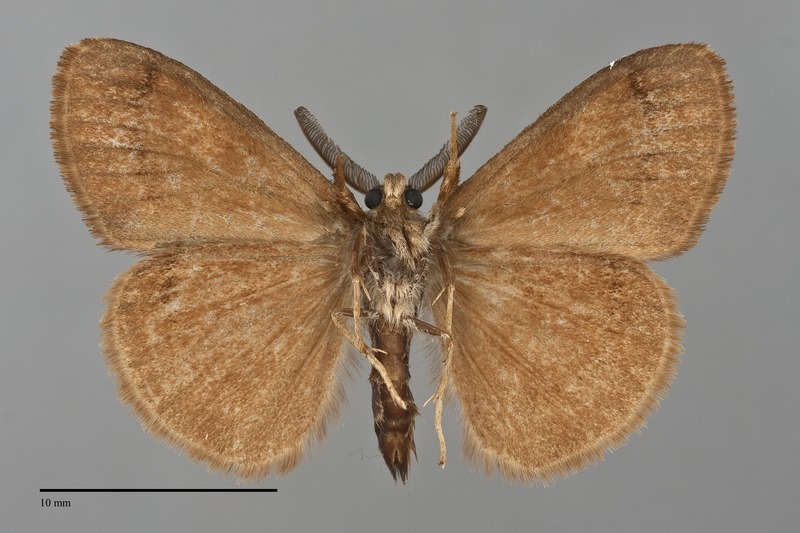 This species can be recognized by its southwest Oregon locality, small rounded wings, broad antenna, and relatively even dark brown color with diffuse discal spot and pale subanal spot. It is most likely to be confused with Orgyia cana. 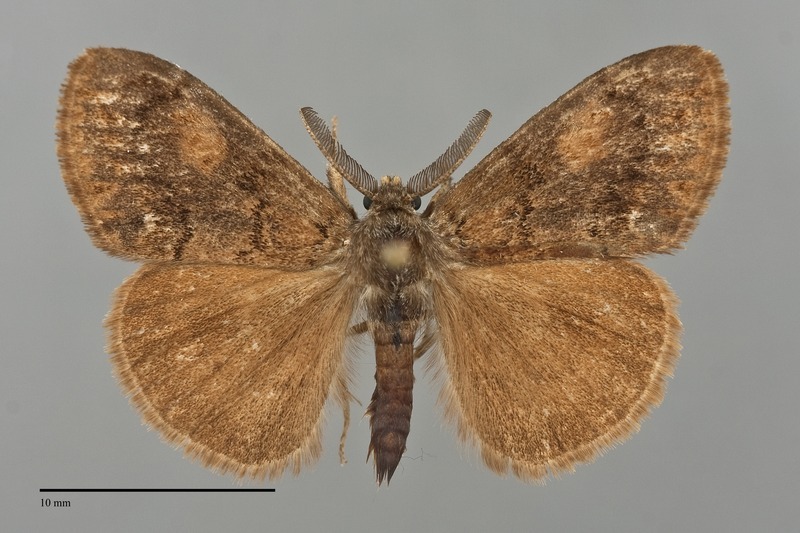 This species is usually more blue-gray on the forewing and has gray-brown hindwings that lack a warm cast. Orgyia vetusta also resembles the more widespread species Orgyia pseudotsugata. It has darker forewings with a straighter lateral margin and brighter rusty brown hindwings with a defined dark marginal band. The females of these species cannot be distinguished reliably. 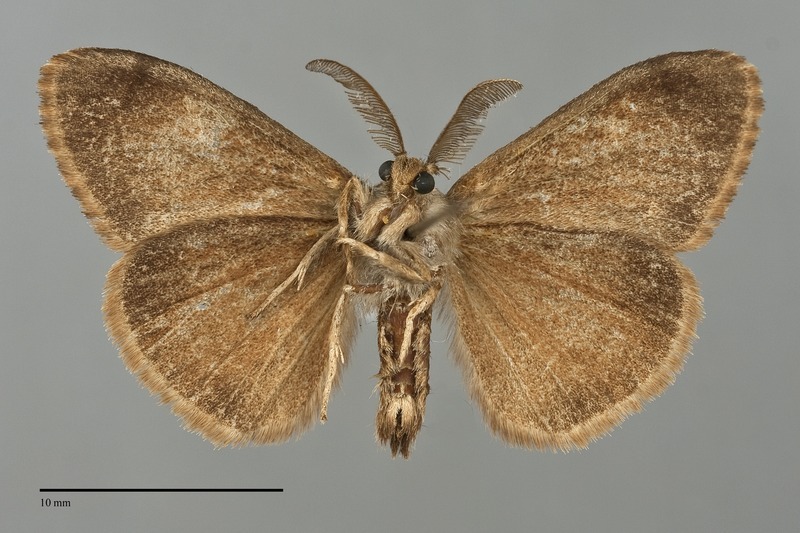 Orgyia vetusta is found in forests with oak. The Pacific Northwest range of O. vetusta is limited to the Klamath Mountain region of southwestern Oregon. Only a few records of this species exist for our region. The range of this species extends south through California to the border with Mexico. It is found predominantly near the coast except in the northern Sierra Nevada. The larvae of O. vetusta has been reported to feed on a broad variety of broad-leaved trees and forbs. Ferguson (1978) lists a number of hosts in various plant families, including oak (Quercus spp. ), Arctostaphylos, apple (Malus spp. ), cherry (Prunus spp. ), and lupine (Lupinus spp.). The distribution suggests that oaks may be the preferred foodplant. The adults of this species fly during the summer and early fall. The few records of this species from our region are from early June, late August, and early September. The flight period given by Ferguson is more limited to spring and early summer in California. The larvae of this moth have been reported as a pest on fruit trees in California.